Bookworm1 and I continue to read chapter books so long as I promise an incentive for each chapter book we read. He likes books, he just claims not to like long ones. However, he's usually more game to "read another!" chapter than I am. I also frequently catch him browsing through whichever chapter book we are in the middle of, looking at the pictures. I can't decide whether or not it is cheating to have him get an idea of what's coming or if I should let him continue to look as it seems to be keeping him interested. He loves playing Legos while I'm reading to him. Frequently I wonder if he's actually listening to the words coming out of my mouth. However, every so often he'll ask me, "What does that word mean?" or he'll laugh over the dialogue. He's listening. He's just multi-tasking. Since I am NOT an audio learner, this is different for me. It seems that we are currently both enjoying the process of reading books together. 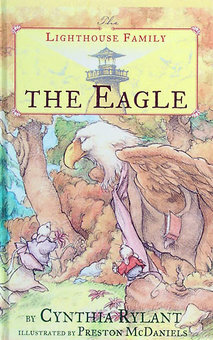 We read the fourth book in the Lighthouse Family series, The Eagle and enjoyed it. These are beginning chapter books and therefore have incredibly short chapters (and few at that!) The first book I thought was very cute. The second seemed to run along similar lines as the first (sea animal in trouble, the Lighthouse family saves the day, etc.) and by the third I confess to being a little bored. I can't NOT finish a series though and Bookworm1 really, really likes ocean animals. So we persevered. In this particular title, sibling mice Whistler and Lila make friends with a bald eagle and invite him home to tea. My adult brain kept waiting for the moment when the eagle ate the mice but this is a very sensible and sensitive children's story. Nothing scary ever truly happens. We must look for our excitement elsewhere. 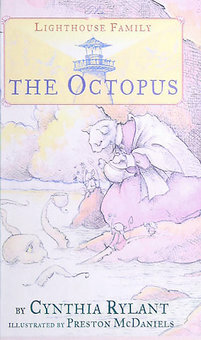 Because I am willing to be faithful to the end of the Lighthouse Family adventures, we concluded our escapades with them by reading The Octopus . This is the pinnacle of the series and the one we were most looking forward to, seeing that the octopus has been a favorite creature around here for some time now. In this story a baby octopus named Cleo gets stuck in a tide pool. Whistler and Lila keep him company while waiting for the tide come back in. They make friends with Cleo and are delightedly amazed that he can do such things as change colors. Cleo returns to the sea with the tide but comes back to visit the entire Lighthouse Family, bringing with him his parents. (This would never happen.) But then again, in the real world, an octopus wouldn't tap a mouse on its shoulder and introduce itself. (I confess it, even though I know these stories are sweet ones, I still kept waiting for the octopus to grab the small mouse and CHOMP it with its beak. Not gonna happen in this series. It is safe, safe, safe!) We are now officially done with this series and I am personally glad of it, although it was cute while it lasted. After reading those soothing stories of the sea, I wondered how Bookworm1 might do with something slightly more exciting. So, I pulled out some spicier selections and he chose The Flint Heart. (I've linked that to my review.) I read this for myself just last fall and when I read it I mentioned that I had a nagging suspicion that it had underlying messages that I wasn't sure about. As I also mentioned, it's an engaging story and a darker fairy tale. There is blood and war and glory all wrapped up in this. Bookworm1 really liked the story from that perspective. I asked him for his opinion after we were done reading and he said he "liked it very much." His mother, on the other hand, was not that thrilled. In fact, I so distinctly did not appreciate the pervasiveness of this message and the importance that the authors placed on the idea that everyone can be right all at the same time (even if their answers are distinctly different), thus eliminating the idea that anything can be proven true, that I have decided to take this book off of our bookshelves. I'd really rather not read it again. There are better books out there. We'll spend time with them. After that book I really pushed for something funny to read and offered some new options. Bookworm1 selected Hank the Cowdog. This is going very well. I'll share more about that later. The legos are a great idea, particularly for boys, who seem to need to wiggle while listening. My older son actually picks up more about certain topics (such as science) than his older sisters, despite his seeming distraction. I appreciate your discernment of the message in The Flint Heart. There's too much of that worldview out there already to be reading books with that message. And my oldest son has always needed something to do with his hands while listening--Legos, making potholders, drawing, magnets, a puzzle. . .I'm like you, a visual learner, but I have learned that he is getting every bit as much out of the reading (if not more!) than I am even as it seems to me he is distracted. Good for you for keeping going with the Lighthouse series :) My reaction to it was exactly the same as yours - I liked the illustrations, short chapter length, appealing animal characters, and lack-of-inappropriate-topics, but the story itself was (in my opinion) sooooooo not exciting. But my daughter, like your son, didn't seem to be bothered by the lack of action. Luckily, I hadn't told her it was a series, though, so I could avoid reading the whole lot of them! I would also be waiting for the eagle to pounce on the little mouse. This is why I love Beatrix Potter--her stories are very REAL. Thanks for your review of The Flint Heart. I support you. Today, there is no truth, just what we think or feel is right. Unfortunately, few people have a clue about what is right and even few actually do it. We do need an absolute truth to be our foundation, and children need to learn to seek out the correct answer in many situation. I realize (as an English teacher) there can be more than one "right" answer in some situations, BUT my students are required to support it with the text and develop a logical argument. I'm frequently left wondering if Grasshopper is hearing anything at all while I'm reading to him. I'll keep this post in mind, and hope that he hears more than I think. 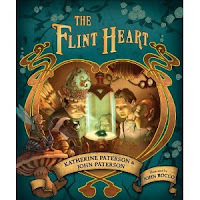 The Flint Heart is definitely off my list now! N1 always seems to listen better if she's drawing or building while I read while N2 needs to be snuggled up as. close. as. possible. Such different personalities. Kyle multitasks too (or used to when he was younger and I read to him more often). It also drove me nuts, but I got over it. He is about to turn 8, and is JUST now sort of getting over his "long book" issue, even though he's been a good reader for a couple of years. I requested from the library (what I now realize) is the first of the Lighthouse family series after reading about it in someone else's Read Aloud Thursday post a couple months ago. My daughter read that independently...I'll have to ask her if she wants to read the rest of the series, since I didn't look at it closely enough to realize it was the first of several! My oldest would sit all day on the couch with me and listen to a story. My #2 is not that interested! He also needs something to keep his hands busy. We've had lots of discussions about what are opinions and what are truths (generally in the context of someone liking a food that the others don't). Opinions are OK, as long as they aren't confused for truths - and vice versa.